American Express found over a third of Gulf households spent more than they planned in 2015. American Express said it had not witnessed a rise in credit card debt in the Gulf region, despite over a third of households reporting they had spent more than they planned last year and one in four in the United Arab Emirates (UAE) saying they had contributed less to their savings and pension. 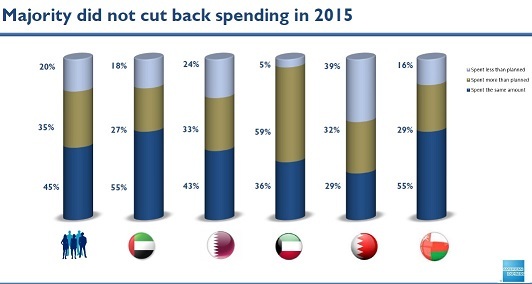 A new survey released by American Express Middle East on Tuesday showed that 35 percent of respondents in Gulf Cooperation Council (GCC) countries had spent more than they expected last year, while just 20 percent reported they had spent less than projected. "Despite the economic headwinds across the region, our research shows little slowdown in the volume of spending," CEO Mazin Khoury said in a statement. The 'Spending Habits in the GCC: A Research Report', compiled by marketing firm GfK during November and December 2015, consisted of face-to-face interviews with 430 respondents who were the main decision makers in households earning a combined income of $75,000 or higher and had lived in the Gulf for at least one year. While the study included the UAE, Oman, Qatar, Bahrain and Kuwait, it did not cover Saudi Arabia. Khoury told Zawya he had not seen any increase in levels of credit card debt and that he was not concerned about changes in repayment trends, despite rising consumer spending levels and a more challenging financial environment as a result of lower oil prices and slower economic growth. "We are not seeing a rise in credit card debt...We have not seen that yet due to the efforts of the government to establish a credit bureau recently. [GG1] It has helped us immensely and it has helped to ensure you give the product to the right person and we are a responsible lender," he said. "With existing customers we have sophisticated tools to know more about our customers before it happens." The UAE government launched the Al Etihad Credit Bureau in 2014 to assess the credit worthiness of residents and a report by Abu Dhabi newspaper The National in October 2015 quoted a spokesperson from Citibank as saying the lender had seen a rise in the number of loan application rejections since the bureau was introduced. A 2015 survey by Citibank and the Al Etihad Credit Bureau, which was carried out by the marketing agency YouGov, found credit cards was the main source of personal borrowing for affluent UAE consumers. The American Express survey comes on the back of a report in late March which found excessive use of credit cards was one of the biggest contributors to debt among UAE residents, according to a study by research firm Strategic Analysis. The study found average consumer debt stands at $95,000 per household or $114 billion in total, with the UAE accounting for around 67 percent of the total household debt among GCC coutries. The study found 60 percent of respondents said they spent more than a quarter of their salary repaying personal debts. Despite consistent levels of spending, the American Express report found a significant change in how people spent their disposable income. "It is evident that people are spending more cautiously and are focusing more on essentials," Khoury said. Over half of respondents over 40 years old said they had begun to spend less on socialising and dining out. In the UAE specifically, 66 percent of respondents said they spent more on food and drink to consume at home. However, 40 percent of respondents also said they had contributed less to their savings and pensions in 2015. 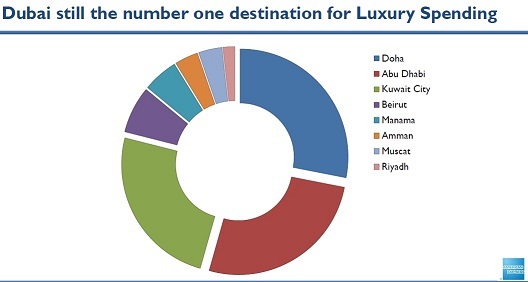 Despite some tightening of belts, Gulf households are still spending their income on luxury items. UAE households are spending 8 percent of their budget, or an average of $2,300 per month, on luxury non-essential items, ranking them second only to Qatar, where respondents spend $4,074 a month of such good and services. 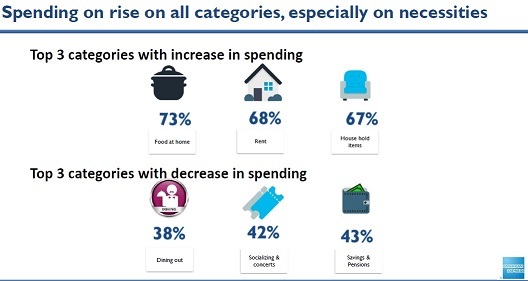 In terms of specific non-essential items, 34 percent of UAE households spent the most on holidays, while fine dining was favoured by 34 percent of respondents. American Express also found the UAE still ranks as the number one destination for shoppers, with 43 percent of respondents choosing Dubai as their favourite place to shop for luxury items, followed by Abu Dhabi, Doha and Kuwait City.